In our New Year Outlook Survey, we asked marketers and agencies about challenges for 2018. Two articles resonated with me on the topic, and I think will with you as well. Couple these challenges with what your prospects are concerned about: Mars marketing chief: ‘It’s probably never been a more challenging and disruptive time to be a marketer’. So you, as an agency are well aware of the challenges, and your prospects/counterparts are right in line on those challenges. Certainly sobering, and I realize may not affect you directly, but it’s indicative of the climate. What’s interesting, and heartening, is marketers and agencies, at least in our survey responses, have never been as aligned as they are going into this year. But it’s also a wake-up call: however you go about it, the rise of in-house agencies, the search for specialization, and continuing competition (to name just three factors) means you have to actively seek out new business, regardless of how well your agency is doing. And the first place for you to start? Your positioning. It’s the first place we start when a new client comes on board, because without a concise, differentiating statement of who you are, you immediately fall into this prospect bucket: Confusing positioning and marketplace crowding”. In our 2018 RSW/US New Year Outlook Report, we unearthed a significant shift in the market that might have bigger, full-service shops concerned. Today, more so than years past, marketers are looking to fill specialty talent voids left by their roster shops at what could be considered an aggressive pace. 1. The media/marketing landscape is extremely fragmented and getting more complex, thus creating a greater need for smart, specialized agencies to complement existing relationships. 2. The growing importance of data and analytics. This year 87% of marketers stated data/analytics was important when looking for a new agency. 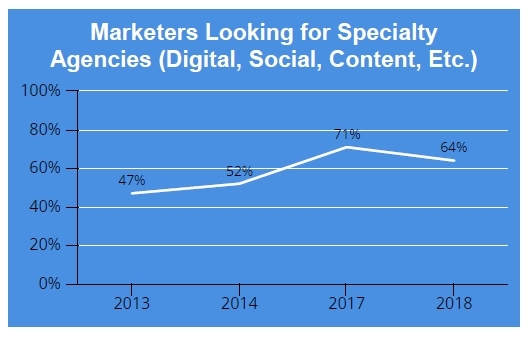 Last year, only 73% of marketers felt that way, so the growing need to find agencies that are solid in this area, drives marketers to more specialized firms. …only 15% of Marketers feel their agency is “Very Effective” at supporting their need to measure return on marketing investment. Agencies also aren’t too enthusiastic about their own skills (only 38% rated themselves “very effective”). So, while all of these findings in no way suggest agencies need to drop everything they’ve been doing and suddenly become specifically specialized, it does suggest that agencies need to stay steps ahead of their clients and bring them the expertise they need and deserve. In 2015, we created an infographic called 8 Animal Traits Agencies Need to Survive. One of those animals, the ant, was used to represent the need for agencies to be curators of “best-in-class” talents – owned by the agency or otherwise. In our surveys, marketers tell us that agencies don’t have to own it all – strategic partnership are fine. So if an agency is lacking in specific talents, they need to get out there and find it before their client decides to find it on their own. Where Will Your Prospects Spend This Year In Media? In 2011, 85% of agencies believed their marketing counterparts would “Somewhat” or “Significantly” increase their Social Media spending in 2012. Only 65% of marketers felt this way. In 2016 34% of marketers expected to see increases in Traditional Media spending. Only 19% of agencies felt this to be the case in 2017. Fast forward to 2018 expectations, and as I mentioned above, marketers and agencies are on the same page, for the most part. Q: Have we reached a point yet where advertisers and marketers think digital first and traditional platforms second? If not, why not? My new year’s resolution for 2016 is to ban the notion of “digital” and “traditional” being separate elements. They’re not; it’s all Marketing (with a capital M). Teams must be proficient in developing strategies and tactics along with the prioritization of such programs. Q: What’s something most brand managers or digital marketers get wrong? An over-reliance on programmatic buying. It does play an important role, but for me quality is an overriding importance. Programmatic is perhaps not the most apt example of your “shiny object, but technology certainly is, and we asked marketers and agencies about their projected investment in 2018. 20% of agencies expect their marketing clients to “significantly” increase their investment. Only 7% of marketers feel the same way. In a separate question, 80% of marketers told us they do not expect to move monies out of their marketing budgets into things like VR, AI, and AR. As ever, be careful in your initial positioning what you hang your hat on. Marketers want to know your agency is forward-thinking and educated on trends, but they‘re sometimes just that, a trend. Make sure your positioning reflects a balance of your core offering and any cutting-edge or new technology you’ve incorporated. https://www.agencynewbusiness.com/wp-content/uploads/2018/01/Where-Will-Your-Prospects-Spend-This-Year-In-Media-2.jpg 546 818 Lee McKnight Jr https://www.agencynewbusiness.com/wp-content/uploads/2018/08/Updated-RSW-logo-2018-small.png Lee McKnight Jr2018-01-10 16:02:532018-01-12 16:03:12Where Will Your Prospects Spend This Year In Media? RSW/US’s Lee McKnight with the final video in the “60 Second Series” on our 2017 New Business Outlook Report. Specifically, we’re talking marketers moving agency services in-house. Like the increase in project work we saw in our report, this is another trend that’s increasing in 2017. Nearly 80% of agencies predict their clients will move some marketing services in-house in 2017 — that’s a 23% increase over 2016’s prediction. What does that mean for your new business program? Our latest agency new business video explores some key areas agencies should be aware of to better prepare for the future. Our video highlights the importance of marketing technology, the rise of CIO’s and continual investment in your business. Join us on March 1st at noon EST for our 1 hour (free) New Year Outlook Webinar that showcases key findings and critical implications for agencies and PR firms as they roll through 2017. While some aspects of your business will remain the same in ’17, there are several trends that are sure to force change in how you pursue new business, how you evaluate business opportunities, and how you manage your client relationships. This is our 11th year releasing the New Year Outlook survey and as in past years, there are new and provocative findings we look forward to sharing with you. A few recent posts that will help set the table for our webinar: Client Turnover-Uncomfortably Numb and Combating the rise of in-house agencies. …it would be worth peeling back a layer. A data point that stood out in the RSW/US 2016 New Year Outlook Survey was 34% of Marketers indicating plans to increase spending somewhat or significantly in traditional media. This is the first time in recent years that Marketers indicated intention to increase traditional media spending to this degree. It far outpaced the expectations Agencies expressed regarding clients’ traditional media spending plans: only 19% of Agencies forecast traditional media spending to increase somewhat or significantly. The gap between Marketer and Agency forecasts was so compelling that we wanted to see what more there was to learn behind the Marketer responses. To great degree, it’s a matter of size. Analyzing Marketer responses by annual revenue, it became apparent that those Marketers forecasting more traditional media spending were those whose revenues greater than $500M. Furthermore, nearly half of these respondents post revenue greater than $1 Billion. Perhaps not surprisingly, none of the respondents from companies of this size forecast decreasing spending in general. For them, social media was the only exception, and this was limited to only two respondents. While questions still linger around agency/client alignment at the strategic level*, here’s a tactical implication from the agency new business perspective: if your firm excels in traditional media, focusing your new business efforts on larger companies will be more likely to generate results. As noted in the 2016 Salesforce State of Marketing report, “the term ‘digital marketing’ borders on redundancy.” The report goes on, saying 2016 is a “tipping point”, with more than 70% of Marketers total budgets directed toward digital channels. When does “digital” become the new “traditional”? This, of course, raises further agency new business questions. Just one is: if your business was founded on digital expertise at a time when it was rare, and your services are exclusively digital, how do you differentiate yourself as redundancy grows in “digital marketing”? So many layers to peel back in the agency new business world. Answers exist to all these questions. It does take some peeling back of the layers to define a strategy that uniquely carries your firm to agency new business success. Take advantage of our resources, or give us a call. Post: Agencies: Have you Checked Your Client Alignment Recently? In his timeless book, 7 Habits of Highly Effective People, Stephen Covey identifies the first habit as “Be Proactive”. Always true in agency new business, it’s particularly important to remember when times are comparatively good: to be ultra-proactive – to make hay while the sun shines. In this recently posted video, RSW/US Owner and President, Mark Sneider highlights findings from the 2016 New Year Outlook Survey that focus on Marketer spending forecasts for the upcoming year. In the 10 year history of this survey, Marketers projected the one of the largest year-to-year increases in marketing spending: 62% of Marketers reported their marketing budgets for the year ahead were somewhat or significantly higher than prior year. This is up 11 percentage points from 2015, when 51% of Marketers offered their forecast. The finding is reinforced by a report by Marketing Charts, based on research conducted by StrongView. Certainly, this news has a shelf-life as economic and business outlooks change over time. However, the implications for agency new business activity endure: higher spending does NOT automatically translate into greater ease in landing new clients. Competition for agency new business intensifies every year, whether marketer budgets are expanding or contracting. As Mark stresses in the video, a year when Marketers are investing more in marketing is one to keep pushing – even harder – on landing new clients. So, “make hay while the sun shines”…and in agency new business… keep the press on during all the other times too. Doing the Homework for Agency New Business? Not just nagging here: doing the homework on your prospects is crucial. Marketer feedback from the 2016 RSW/US New Year Outlook Survey brings up a recurring theme: marketers feeling like their agencies do not understand sufficiently their business, their industry or the challenges they face. Certainly, marketers want their current agency partners to be vested, engaged and even ahead of the curve on developments in their organizations and industries. Marketer responses to the survey tend to express the plusses and minuses of their current agency relationship. This relationship succeeds when the agency possesses deep, intimate understanding of the client’s business. It’s fundamental for a strong relationship. It’s also foundational for building relationships with prospective clients. In agency new business, attempting to break through to prospective clients without understanding the prospect’s business and the challenges they face is very likely to result in no response to your prospecting. The RSW/US eBook, Put on that Damn Sales Hat. See Chapter 3: Your Prospect’s Homework isn’t Good Enough. From our Agency of the Future Series, see how partnership characteristics represented by “The Horse” encompass deep familiarity with your client’s business and industry. Also, see the recent Small Business Trends post, How to Get Into the Mind of Your Prospects. It also emphasizes the need to understand your prospect before you make contact and highlights questions to ask as you prepare to make contact. So, you have your assignment as you prepare for your next call – and meeting – with a new prospect. Make sure you are doing the homework for agency new business in advance. It shows you truly care about the prospect and the challenges they face. Showing your understanding of their world will lead to a more productive conversation – with better odds of continuing the conversation. https://www.agencynewbusiness.com/wp-content/uploads/2016/03/Nag.jpg 852 1280 Mark Sneider https://www.agencynewbusiness.com/wp-content/uploads/2018/08/Updated-RSW-logo-2018-small.png Mark Sneider2016-03-03 16:42:522017-02-20 16:10:51Doing the Homework for Agency New Business?